The Washington State Patrol is anticipating the need to fill several hundred Trooper positions over the next several years. This process is competitive and we typically will test between 1,500 to 2,000 applicants to find 60 quality people we can hire. You shouldn’t start the application process until you are less than six months from separating from the military. Please visit our web page at www.wsp.wa.gov for up to date information on hiring. When you are ready to test please go to publicsafetytesting.com to schedule a written, physical fitness test. 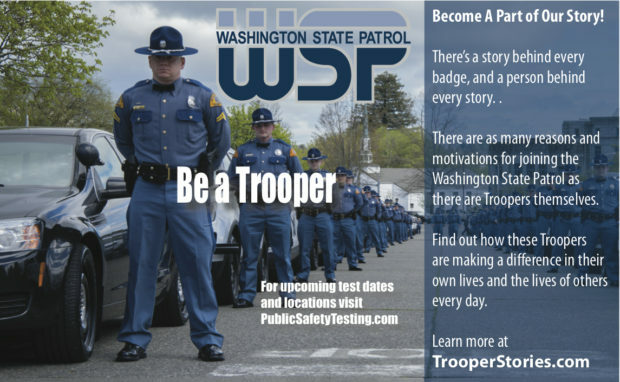 If you are outside of Washington State and interested in testing for the Washington State Patrol, please follow the instructions listed on Public Safety Testing’s Out of State webpage (https://www.publicsafetytesting.com/outofstate) to set up a test in your area. The WSP has four phases to our hiring process. It typically takes 90 to 120 days to complete the hiring process. To apply go to our website www.wsp.wa.gov and select trooper positions or go to publicsafetytesting.com and select Washington State Patrol. The Washington State Patrol (WSP) is a nationally accredited law enforcement agency made up of dedicated professionals who work hard to improve the quality of life of our citizens and prevent the unnecessary loss of life on a daily basis. To be the best public safety agency in the United States. The character of police officers today is continually being challenged. Because public scrutiny is particularly intense for uniformed personnel, applicants seeking employment with the Washington State Patrol as a Trooper Cadet must possess an exemplary background and personal history. The nature of police work necessitates that only the best applicants are chosen. We have provided our standards to assist you in making a realistic assessment of being hired as a Trooper Cadet. • Current Military -Please do not apply until you are within six (6) months of your ETS date. Please contact the WSP Human Resource Division (HRD) if you have any questions. Let us pay for your academy training and pay you a salary while you attend. Trooper Cadets – $4,500.00 monthly base salary. After successfully completing the Trooper Cadet Training, Trooper Cadets are promoted to Trooper and will receive a Trooper’s monthly base pay of $5,126.00. Once a Trooper has reached six months from their commissioned date they will receive the following step increases until they have their fifth year of commissioned service. After a Trooper reaches their fifth year of commissioned service, they will receive 2% longevity pay every five years of commissioned service. The policy of the Washington State Patrol (WSP) is to recruit and provide equal employment opportunities for all applicants. The affirmative action information requested in this on-line application is voluntary and is only used for reporting affirmative action information to the state and federal government. State Employees are members of the Washington Public Employees’ Retirement System (PERS). New employees have the option of two employer contributed retirement programs. For additional information, check out the Department of Retirement Systems’ web site.